After Brexit, the discontent of some Europeans towards the collective project of the European Union (EU) has become apparent. However, the British are not the only ones that seemingly have a negative image of the EU. In recent years, Euroscepticism has grown among citizens in nearly all of the member states, with some of this discontent reflected in political parties that support the recuperation of national sovereignty and even exiting the EU. Even so, under the label “Eurosceptic” there are parties grouped together with very diverse positions: from those critical of the EU integration process, to others that openly oppose any steps forward in that respect. Different authors have tried to generate more precise typologies at an analytical level, for example distinguishing between euroscepticism, eurocriticism, and europhobia, or between euroenthustiasts, europragmatists, and eurorejects, or the differences of soft and hard Euroscepticism. In this respect, the emergence of Podemos aroused much curiosity among international observers, on occasions being considered from abroad as a Eurosceptic party. In this article we further analyze the evolution of the party’s positioning and of their voters, and we see that more than hard Euroscepticism or europhobia, Podemos’s vision should actually be classified as “Eurocriticism” or “soft Euroscepticism”. Euroscepticism in Spain and Europe. Normally, Spain is seen from both inside and out as quite a pro-European country in which European integration has not generated large conflicts among the parties nor their voters. The existing European consensus in Spain is based in, for some authors, as much as in material elements (the evident material benefits associated with adhesion) as in emotion elements (the large degree of symbolic and emotive identification with the EU). Yet, apart from the consequences of emotional aspects or economic calculations, the support for the EU can be explained as a consequence of the interplay between supranational and national politics. That is why the positive vision towards the EU has traditionally been larger in countries that suffer greater corruption and have less-developed welfare states, such as Portugal, Greece, and Spain. This is due to the opportunity cost of transferring sovereignty is smaller in these countries than in other such as Denmark or Sweden. However, while the Spanish support of integration has been almost always situated above the European average, even before the economic crisis some authors identified a certain soft Euroscepticism in Spain. On one hand, although traditionally there has been a high percentage of Spanish citizens very optimistic about the European project, the percentage of citizens with no defined attitude towards the EU has been larger than the European average. And on the other hand, by analyzing in detail the positions of the voters and parties in different moments, these authors show the existence of the first symptoms of decline in support with the launch of the EMU project. The increased criticism was championed by Izquierda Unida (United Left), which denounced the lack of a social dimension in the European integration process. The global and Euro crises have had considerable impacts on the attitudes towards the EU. In these years the support for the EU shrank in the 27 member states, although the decrease has been large in Southern European countries; traditionally these countries have had a favorable vision of the EU but they have suffered most heavily the consequences of the crisis. This increase of Euroscepticism has taken place at the same time as other changes in the party system: in the south of Europe new parties emerged, and in other member states already existing far-right anti-establishment parties grew, such as Alternative für Deutschland, FPÖ in Austria, or the Front National in France. Frequently, Euroscepticism is associated with right-wing and populist parties which have clear nationalist and anti-immigration positions. However, the discontent with the EU should not strictly be associated with a single ideological position. Recent opinion polls like ones from Pew Research show that in some nations Euroscepticism is a right-wing issue, while in others it is a left-wing cause. In fact, inside the same country, there are parties diametrically opposed ideologically, but with similar positions towards the European Union; in Greece SYRIZA is as eurosceptic as Golden Dawn, or in Italy the Five Star Movement and the Northern League. Before the formation of Podemos, the current General Secretary Pablo Iglesias maintained that the solution to the economic crisis in the countries of Southern Europe required recuperating monetary sovereignty, which included the exit from the Euro and nationalization of banks. Now inside the institutions, Podemos has been critical of the current functioning and some policies of the EU, resulting in votes against the advancement of economic and political unification. However, although their voters mistrust some of the European institutions, they seem to support the advancement of unification more than voters from other Spanish parties, and also more than Eurosceptic parties across Europe. – In their electoral platform, Podemos critiques the current model, but does no discuss exiting the Euro nor the EU. From the beginning, Podemos has opposed the “neoliberal decrees” of Brussels and reclaimed sovereignty of the nation-state. In the platform used for the European Parliamentary elections in 2014, Podemos supported repealing the Treaty of Lisbon “so that public services are not subject to the principle of competition and neither should they be commodified.” Moreover, they championed the “opening of a process that moves toward the refoundation of EU institutions by means of a constituent assembly” and they promoted the development of a “mechanism of integration and cooperation specific to the countries of Southern Europe.” Though the platform did not contain an amendment on the totality of the EU nor did there exist an explicit reference to exiting the euro, neither did it openly affirm the any desire to advance greater economic and political integration. Electoral platforms give an initial idea of the party’s vision, but to truly understand the positions of Podemos on European integration, it is worthwhile to analyze the way they vote in the European Parliament. This analysis is possible thanks to the data from VoteWatch Europe, an independent nongovernmental organization that compiles the votes of the Europarliamentarians from all of the member states and political groups. 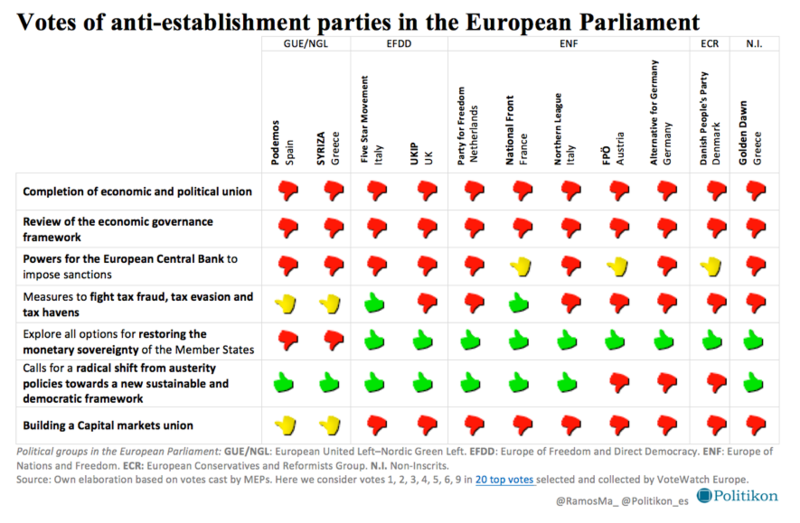 As can be seen in the following table, the members of the European Parliament (MEPs) from Podemos vote the same as the majority of anti-establishment parties (and contrary to the other Spanish parties) on key questions of the process of integration in Europe. For example, they have opposed the finalization of the process of an economic and political union, and also have come out against EU economic policy coordination. Moreover, they have supported measures focused on promoting a radical change from austerity policies, towards a new democratic framework. However, unlike the other European anti-establishment parties, such as Alternative for Germany, FPÖ of Austria, Italy’s Northern League, UKIP, the Danish People’s Party, or Italy’s Five Star Movement, Podemos has firmly opposed restoring monetary sovereignty. That is to say that, same as Syriza, Podemos does not promote exiting the Euro, splitting the Monetary Union, nor do they strongly disagree with the construction of a capital markets union. If we compare the attitudes towards the EU of Podemos voters with those of voters of openly Eurosceptic parties, we find similar low levels of confidence in institutions. However, Podemos has a much more favorable vision of European unification. Namely, Podemos voters take views very similar to those of Austria’s FPÖ or the French National Front with regards to confidence in the European Parliament; two out of three Podemos voters have very low confidence in the European Parliament, while only 7% show high confidence. However, they do not mistrust the European Parliament in such high levels as UKIP voters. The larger differences between UKIP and Podemos are in the vision of the EU’s future. In any event, the most agreed upon option is the devolution of EU power back to national governments. However, in Podemos—as also the case with France’s National Front and Italy’s Five Star Movement—almost one in every three voters would like to give more power to the EU. In fact, as seen in the following graphic, more than half consider that unification should go further. – Compared to the rest of Spanish voters, Podemos supporters trust less the European Parliament and blame the EU for the domestic economic situation, but they have more interest in EU topics and believe that unification should go further. 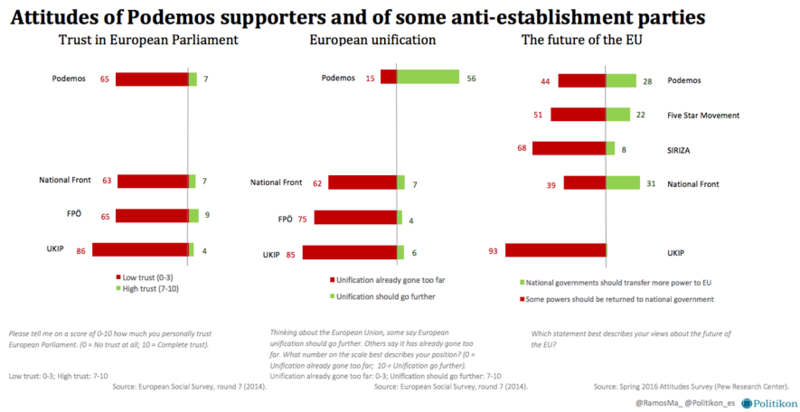 Finally, by comparing Podemos voters with Spanish supporters of other parties, one can see certain ambivalences in their attitudes towards the EU. 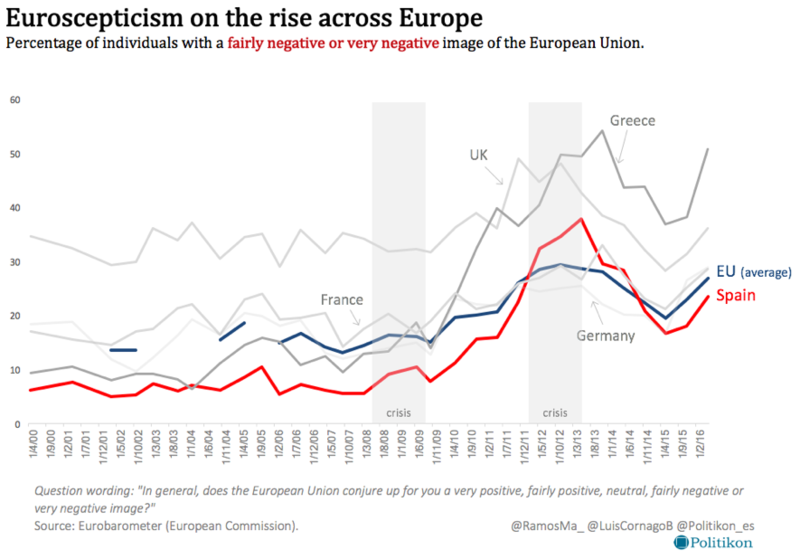 On one side, they have a more negative vision than the rest: they trust the European Parliament less and have more negative attitudes towards the EU than the Spanish average. Additionally, the vast majority of Podemos voters, 81%, blame the EU for Spain’s economic situation, a figure 17 points above the national average. On the other side, these same Podemos supporters show a much larger interest in news regarding the EU, and recognize its considerable influence in the lives of its citizens. Most importantly, these voters are in favor of more integration, namely 56% would agree with the idea that unification should go further, while the national average shows that only 44% of Spanish voters agree. Ultimately, taken as a whole the aspects of their electoral platform, their voting record, the attitudes of their voters, and following the distinction made by Taggar and Szcerbiak between soft and hard Euroscepticism, Podemos cannot be associated with hard Euroscepticism, understood as opposition to the European integration and the desire to withdraw from membership. However, everything suggests that Podemos is a party clearly close to soft Euroscepticism. In other words, they support membership in the European Union and even want to advance unification, but oppose specific EU policies.